Weighted Vest with Reflective Stripes All Around! Research on weighted vests has shown promising results for osteoporosis prevention. It’s another strength training tool to increase muscle strength which stimulates the development of bone strength. I’d first get the okay from your doctor or physical therapist about the safety, for you individually, of wearing a weighted vest. If you have health issues or bone loss, work with a physical therapist or other qualified health professional before using a weighted vest or belt to make sure that you can move safely while wearing it. Do several months of consistent strength training to get a good base of strength before trying a weighted vest. Be sure to include core exercises. The strength workouts in my 2 DVDs are appropriate for this because they include core exercises for the back and abdominal muscles, as well arm and leg exercises. Wear it for only a few minutes at first, gradually increasing the time as tolerated. If you’re experiencing pain anywhere, don’t wear it. If I wear mine too long, it bothers my lower back. Keep excellent, upright posture with shoulders back and down. Stand tall! If it’s too hard to do that, don’t use the vest. When I wear mine, I have to be diligent to not slouch. Get a vest with adjustable weights and start very small, with only one weight insert. Move slowly. Your center of gravity is higher and your balance will be challenged. In general, use a weighted vest only when standing upright, doing weight bearing (on your feet) exercise and not bending over. It could put too much pressure on your muscles and spine, even if you have great posture and hinge back at the hips when you bend down. The subjects in the weighted vest research studies did not have bone loss or other health issues that could have put them at risk. It could be very unsafe to wear a weighted vest or belt at all if your bones are extremely fragile, if you have kyphosis, rounding of the upper spine, or balance problems, to name a few. Depending on your bone strength, wearing one could put you at risk of a vertebral fracture or fall. If you get the go-ahead from your health care provider, a National Osteoporosis Foundation (NOF) affiliated physical therapist suggests looking for a weighted vest that fits well through the torso and isn’t top heavy. “There are some weighted vests that are not safe for people with osteoporosis, especially if they have kyphosis (curvature of the spine). These include vests that sit on the shoulders and only have weights on the upper part of the trunk. This could increase the stress on the spine, causing increased kyphosis. A safer vest is weighted throughout the trunk. These are especially good when they are well fitted at the waist. This should spread stress evenly around the trunk, reducing the weight from the top of the shoulders. They must fit very well, be tightened around the waist, and should still not be used if the person has kyphosis.”…or very fragile bones. Some suggest using a backpack filled with books. It’s not a good thing to do because it wouldn’t be “…weighted throughout the trunk…”, plus, it’s uncomfortable. With bone loss, get your health care provider’s approval before exercising with a weighted vest! Most often, weighted vests are usually made for men for athletic training. You’ll have to shop around for a woman’s size, usually online. Always keep good body mechanics and move safely when getting up and down. 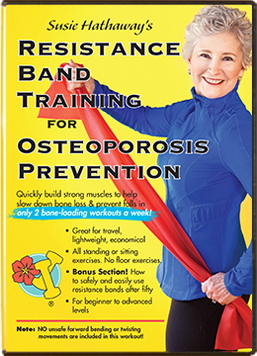 If you have bone loss, I’d skip using the vest with the plank. The weighted vest that I’m wearing in these pictures is no longer available. This one from IronWear Fitness is a one, made specifically for women. It can be adjusted up and down, as well as side to side, for an excellent fit. They also have weighted vests made with mesh that are cooler for summer use. Here’s the link for all of their vests. 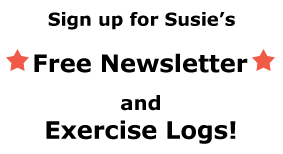 Scroll down to see the women’s styles. Please heed all of the above precautions and stay safe! 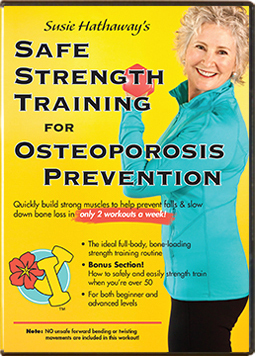 ← Q & A: Weight training for osteoporosis, toned body after 60, “batwings”, and elliptical trainers. My weight vest was purchased from Hyper Wear in Austin, TX. It fits close to the body, has side lacing for adjustments and the weights are 2 oz. ea. I started with 1/2 lb, wore it 2 hrs a day for a week, then 3 hr, etc. until I reached 7 hrs. a day. I then added 1/2 lb more and started the process over again. I’ve been at it 7 days a week since May 8. I do sit while wearing it for the longer duration since I drive a lot. I wear it only for normal daily activities, not when doing yoga or weight training. I’m wondering if 7 days a week is too many and if sitting has any problem attached. I don’t know where to turn for advice and hoped you might have some good information. One thing I was told was to stop wearing the vest for a time after reaching my maximum capability, then start again. My bone density average is -3 in hips and -3 in spine, both have improved a tiny bit since I began eating primarily a vegetable diet and started weight training. I’m 71 yrs old, 4’11” and weigh 92 lbs. Hi Jane! You had a number of good questions, so I went ahead and wrote a new blog post to address all of them so others could read them. 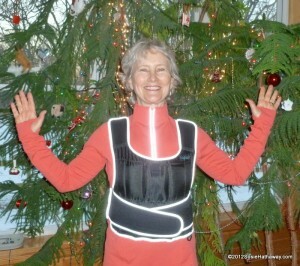 Carolyn, with all of the issues you have with your spine, plus osteoporosis, I wouldn’t recommend a weighted vest. A one-on-one consultation with a physical therapist would be the best option for you. The PT could give you a safe, individualized exercise program, working around your sensitive areas.